Our friend Jen Jones (ex-Schwinn Boulder friend and coworker) invited us to a backyard party here in Carlsbad tonight. And we're home by 9 PM. Goodnight, and good riddance, to 2008. 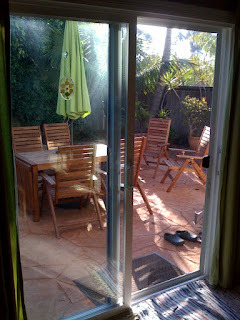 ...and the sliding door is open. Another beautiful weekend, another reason to hop into Klaus the AdventureWagen and check out more of the Golden State. The Queen Mary has been a hotel and major LA-area tourist attraction for over 40 years. We considered spending the night on board at the hotel on Saturday evening, but the rates were a little too expensive for our budget at this time. Built with 1" - 1.5" thick steel palte and plenty of beautiful Art Deco style, she was considered the grandest ocean liner ever built upon her launching in 1936. 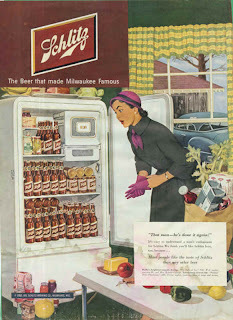 During her heyday, many considered her the only civilized way to travel. With the outbreak of WWII, she was transformed into a troopship and dubbed "The Grey Ghost". After WWII, she was overhauled and soldiered on as a luxury liner for twenty more years until her Long Beach retirement. Upon arriving in Long Beach, three of her four propellers were removed as well as her boilers. As part of the contract between Cunard, the ship's owner during her years in service and the city of Long Beach, she will never again move under her own power. I have a little family history with the ship, I'm told that my paternal grandmother sailed from England on it. I need to get more information on when she traveled. Unfortunately Cunard discarded all of the passenger manifests a few years ago. I first stepped foot on the ship in 2000 when Schwinn Cycling and Fitness had a road show on board. It's still the coolest hotel I've ever stayed at. We took two tours of the ship, both documenting her supposed haunted nature. Not being one that believes in ghosts, supernatural, etc., I still found it entertaining and learned plenty about her history. Don't call it a "boat"
The pool is probably the most interesting space. Filled daily with North Sea ocean water and (mildly) heated by the boilers and the fact that it was above and between two of the boiler rooms, first class passengers would swim first. After the first class passengers swam, third class passengers were allowed in. After the third class time was up, the water was drained and refilled with fresh water for the first class passengers. Second class passengers had their own pool (which has since been removed). Unfortunately when the boilers were removed, so were some of the pool supports - it can no longer hold 24,000 gallons of water. We ate another picnic lunch in our dining room on wheels and headed back to the ship. The second tour, Ghosts and Legends, was more like a show and was filled with special effects - fog, lighting, some pitch black and loud sounds. Sadly they proved to be too intense for our grrrl, so we had to bail after the first "scene". Since we left the show, we spent another hour or so just exploring. Went past the Churchill Suite - where the namesake would stay when on board during the war. Also wandered around the various decks. Allie was craving pizza - and Grubby Chicago Style Pizza finally opened last week, so we decided to hit it to celebrate someone *finally* signing a lease on our Monona house. It wasn't the full-service restaurant we were expecting, but it was fine by us. Kinda spartan and Chipotle-esque in decor (metal chairs, exposed HVAC and lighting), you order up at the counter and wait about 40 min for your pizza. 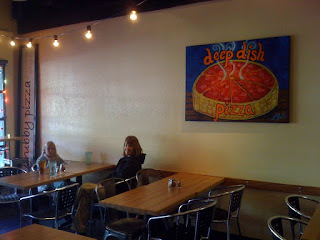 The pizza was pretty dang good - and a true traditional Chicago deep dish. Good sauce, the right amount of gooey cheese and a fair amount of our spinach topping swimming in the mess. The crust, while Chicago-style in shape and depth wasn't quite spot-on, needing some corn meal to give it a golden glow and a nice crunch. I bet some nicely aged pizza pans would do wonders as well as deep dish in Chicago are generally served in blackened pans. 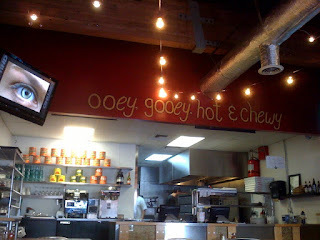 Yes, it was ooey, hot and chewy. Dig the eye channel too. The three of us managed to kill a large. I probably ate half of it myself. Good thing I went for a mountain bike ride an hour later to burn off that gut bomb. Four hours later I'm still stuffed. I'm certain we'll return to Grubby Pizza about once every 4-6 weeks or so. "That man - he's done it again." Very cool stop animation work. Hat tip to Ron for passing these along. Thanks to the generosity of my parents, we took Celeste to LegoLand this past Sunday. LegoLand lies just a few miles north of us here in Carlsbad, so the drive took all of about 8 minutes. LegoLand California opened in 1999 and is pretty much hidden in Carlsbad. You'd never see it driving down the roads that it borders. December is definitely the slow season, so crowds were minimal. Celeste has really been in to Legos for the past couple of months, and I've enjoyed Legos for the past three decades or so. As part of their holiday "Block Party" celebration, they have a 30' Christmas tree on display, made from Duplo blocks. Ornaments are made from Legos. "O Brickmas tree, o brickmas tree..."
For the most part, the rides are pretty tame in comparison to usual theme park fare. Which is fine for Celeste, she's not big into rollercoasters or anything remotely "scary". Unless it involves scaring others. Then she's game. ...which has bicycle-style cranks and pedals. Sadly pedaling does nothing except get the blood moving. After that, we tried the KidPower Tower (or something along those lines). With generous power assist, pulling the rope would bring us to the top of this rotating tower. One of the Lego-themed dining areas had some vintage models on display. Like this 1978 police station - which I had as an 8 year old. Still do, in a Rubbermaid tub at my parent's house. Note that the mini figures had no faces or arms and legs at this point. Throughout the park were various Lego statues of people and animals. After an expensive (but decent) lunch, Celeste and I participated in the fireman challenge. The race involved pumping the truck to get it to the fire, then we had to run out, pump water and aim the stream in just the right place. With just a team of the two of us, we were able to beat three other competing teams of four in the race to put out the "fire". Even though it was a little cool (yeah, yeah, those of you in the Midwest can mock me referring to the first day of winter being "cool", with a high temp of about 58 when you were struggling to hit zero), Celeste insisted on riding one of the water rides. She came back semi-soaked after a pirate-filled adventure, squirting water at various Lego-ish targets along the way. Allie and I decided to not participate. The park's highlight was Miniland, Lego's recreation of some scenes from the US, including California, the NYC skyline, New Orleans, DC, the Las Vegas Strip and "other" - some rural scenes that I guess represents the flyover states (said with tongue firmly in cheek). As Allie put it, "it was a feast for the eyes." Finally it was time to go - but not without visiting Santa and then the gift shop. All-in-all, a great day. And the best part is that we get a free visit in '09 thanks to a special promotion they had going on. Read all about the most awesomest supper club that ever existed here. Thanks Mom & Dad for the tix! Cub Cadet die cast garden tractor, from Ertl. My grandpa was International Harvester's General Counsel in the late 60s/early 70s. This little tractor was on a bookshelf on the second floor of their Green Lake house and matched the tractor that was given to him upon retirement. My brother and I would push it around in the shag green carpeting.